In this two minute HR blast we wanted to focus on interviewing skills and more specifically, making sure you get more of the right people to join your organisation. This follows on from a previous blog that raised a couple of comments about what you can and cannot ask a potential candidate at interview. Starting with the widely held premise that people are recruited for skills and experience but dismissed for attitude and behaviour, logically we then all need to pay a bit more attention to attitude and behaviour when we interview. But are interviewers competent and confident to do this? A few are, but many are not. In fact, the general theme is that interviewers are uncertain how to ask the right questions on anything other than the basics. There is also the added problem of many organisations insisting that everything is so objective that no room is left for interviewers to apply their common sense or experience to a situation and subjective judgements are distinctly frowned upon. Always ask for a covering letter which requires each candidate to set out why they would fit well into your organisation, why they are perfect for the advertised job and why they stand out from the crowd. And when assessing the candidate, give as much value to the content of, and effort put into, this covering letter as to their CV. Note: For those job vacancies where you know you will receive large numbers of applications from non English speakers or from those with low levels of education, why not get them to submit an audio recording or video recording instead? Anyone who has a phone nowadays could do a recording and send it to you, so no excuses! Ensure your first interview is predominantly about assessing attitude, behaviour and team fit. Only those who pass this first hurdle should then go on to be interviewed about their skills and experience. Every other organisation is doing it, so consider what opportunities there are for you to provide unpaid or low paid placements/internships so you can assess someone fully before offering the permanent job. (Beware minimum wage issues and ask us for advice if you have decided to pay nothing). Include in your scoring/ interview assessment a score for how they have treated your admin and reception staff during this interview process. Weeding out belligerence, arrogance and plain old rudeness at the earliest stage is always a good idea if you want team players or leaders. 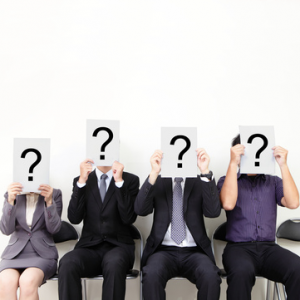 Don’t be so scared of litigation that you fail to ask the relevant and important questions. If you don’t know what you can and can’t say, then perhaps it’s time you got some training on the essentials of employment law which is definitely, in this litigious world of ours, ‘need to have’ training rather than ‘nice to have’. Interviewing is not about ticking boxes and covering your backside. Interviewing is about asking the right questions to ascertain who will genuinely add long term value to your organisation. Selecting the wrong person due to an overly regimented and inflexible recruitment process is both bad for business and bad for the people you interview. So, after they have got through your scrutiny of their covering letter, phone interview, your assessment of how polite and lovely they have been with your admin staff, you now need some great questions for that first face to face interview. A starting point before you even do the telephone interview is to know what is important in your organisation. Loyalty and integrity? Drive and determination? Organisation and adherence to rules? Thoughtful and considered? Robust and resilient? Why not come up with five or six words that really encapsulate the type of person who would be a great organisational fit. Once you have done that, here are a few suggestions for questions. Use these as guidelines to create the questions that will help you understand whether the person in front of you is likely to be one of those who, somewhere down the line, will be dismissed for attitude and behaviour. What is your understanding of great work ethic in today’s world? Can you give me some examples of both good and bad work ethic? Sometimes people say that Thursday is the new Friday and surely its better to spend Friday with a hangover after a great night out, than for a hangover to ruin your weekend. What are your thoughts? In your experience, what is the most common way in which staff waste time at work? One of your colleagues is off sick today. You know they are not sick but that they have taken their elderly mother to look at care homes. Do you keep quiet, or do you report it? You are a checkout operator and you notice that your customer’s apples are bruised. What do you believe you should do? Do you believe that taking home a company pen and a stapler is theft? Give me three of your personal values that sum up how you like to live your life and some specific examples of how you have applied these values in the workplace. If someone asks you to attend a meeting at 9am, what time do you think you should arrive? If you saw a manager bully a member of staff despite always treating you well, would you ever raise that as an issue with a more senior person? If someone asks you to do a job that you feel is way outside your normal duties, what would be your response? What do you like and dislike most about change in the workplace? If you were asked accept additional responsibilities for no extra pay, what would be your immediate reaction? There aren’t any right or wrong answers. Every organisation has its own culture, values and standards so you will need to hear and then assess their answers against those five or six key traits you decided were necessary for your organisation. This is where using your own intelligence, your ability to consider a situation fairly, to assess a person based on your experience etc. come into play. We could provide you with a 1000 questions and still not give you a question that will really get to the nub of what you want to know about the person you are interviewing. So use these as a guide. After giving some serious thought to who tends to not work out in your organisation, create your own questions that will be put to each and every candidate. Interested in increasing the knowledge and confidence of your line managers? Ask us about our essential employment law training and employment law update training courses. We also provide training to organisations on interviewing skills, management skills and of course discipline and dismissal for when, even with the best will in the world, you find you have picked the wrong person for your business!